Clean and protect all types of wheels! Brake dust is the single most destructive contaminant that plagues your vehicle’s wheels. It contains carbon and an adhesive used in the manufacture of brake pads. Add red hot metal shavings to the mix and you’ve got a recipe for corrosion. McKee's 37 Wheel Glaze removes brake dust residue and reduces the appearance of scratches and pitting by lifting out contamination. McKee's 37 Wheel Glaze contains no abrasives. Your wheels are safe with McKee's 37 Wheel Glaze. Glossy, temperature-resistant polymers bond to the wheel to block out contamination. McKee's 37 Wheel Glaze blocks out the sun, sand, salt, snow, acid rain, industrial pollution, tar, and – the worst culprit of all – brake dust. The wheel surface will be so slick that brake dust will be unable to stick. Your wheels will remain clean longer, even in adverse conditions. McKee's 37 Wheel Glaze resists high heat, humidity and extreme cold. McKee's 37 products have been researched and tested in humid South Florida. In these hot and often wet conditions, we found that McKee's 37 Wheel Glaze does not evaporate prematurely or weaken. It continues to keep your wheels clean, shiny, and protected from the threat of corrosion. Professionals will love the easy on, easy off application of McKee's 37 Wheel Glaze. Drivers will love how clean their wheels look days after application. This durable wheel protectant can save you the cost of refinishing or replacing your wheels, especially if you have an import that is prone to brake dust. Regular use of McKee's 37 Wheel Glaze can save your wheels! McKee's 37 Wheel Glaze should be applied to cool wheels out of direct sunlight. Clean the wheel surface with McKee's 37 Foaming Wheel Cleaner Gel. Rinse and dry completely. 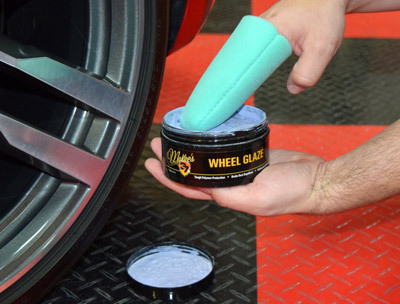 Use a terry cloth or polyfoam applicator to apply Wheel Glaze to wheel surface. Spread a thin, even coat. Allow the glaze to haze over. Buff to a shine with a Cobra Microfiber Towel, turning often to a clean side. Mist the wheel with water and buff once again for the best results. Reapply Wheel Glaze weekly to maintain the clean, shiny finish. After the initial application, you will only need to clean your wheels with soap and water. So when you open, don't have it tilted, it'll pour out. Its not that soild. Didnt do much to reduce my brake dust, adds good luster to chrome though. Tried product on wife's rav4 first before my Srx. Wheels looked new. Haven't washed yet so I don't know how good it is about speeding water. ProsDidn't use very much on 4 wheels and was easy to apply. Not in a solid state like car wax and is very easy to apply. Wipes off just as easy. Great product! ProsLasted couples car washes and does reduce brake dust accumulation.